Those of you with real staying power, those loyal few who regularly read this blog, will know that I've got the full hand of polytunnels. Way back last year in June I built a 3m wide x 3m high x 10m long fruit cage / polytunnel out of water piping and scaffold netting. That's going really well and has easily withstood the winter weather to be filled this season with raspberries, strawberries, tomatoes and melons. 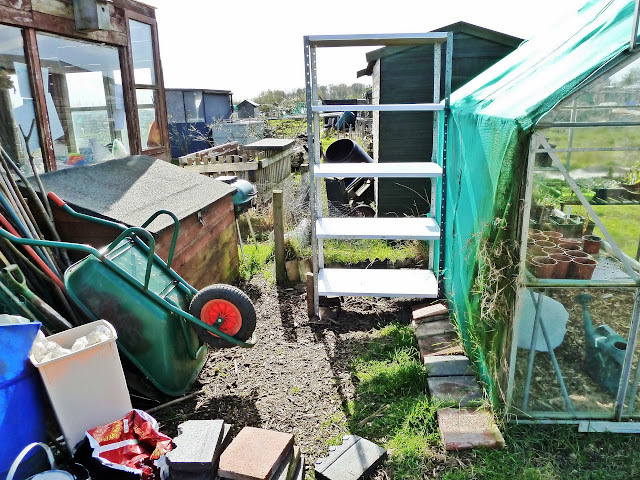 But this post is to give you an update on the outcome of the April topic on a walk in polytunnel, when I agonised over the decision to part with £82 for a 3m x 2m x 2m Gardman walk in polytunnel. So what follows is a pictorial blow by blow account of the polytunnel construction with a summary of it's likely longevity. Just click on any of the images to enlarge. Note : If you're thinking of buying one of these polytunnels, please do read the comments at the foot of this post. You can also read the latest update almost three years on at Gardman walk in polytunnel update. So here's the spot I chose to erect the polytunnel. 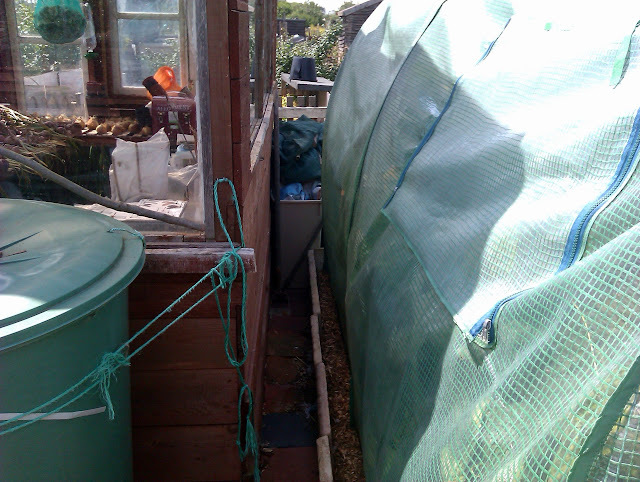 Quite lucky the space between the shed and greenhouse was just right and would give added protection from the wind. Unlucky that I'd only just installed shelves aiming to raise strawberries (bad idea in the end... they don't like an exposed spot). And having the storage bin there was a bit of a problem too... 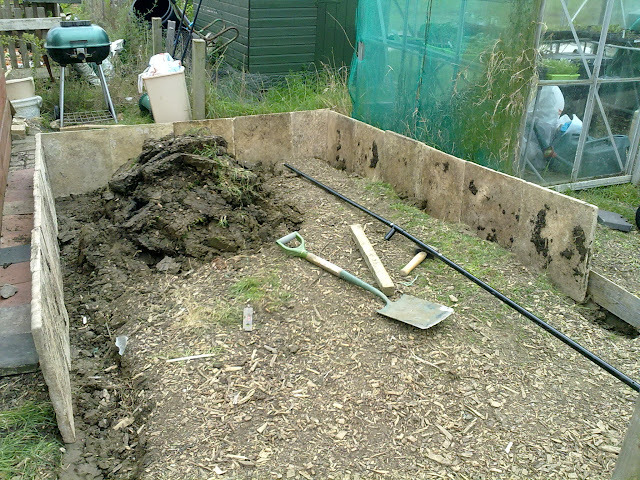 I'd dug it into the ground so it didn't impede the view from the back of the shed... only to find on first use that when the lid was open I couldn't see out anyway! So it would take a lot of shifting. Not a loss overall though since I hadn't been using it fully for some time and stripped down to the frame it would go on to make a good wood store. Site cleared and ready for action! 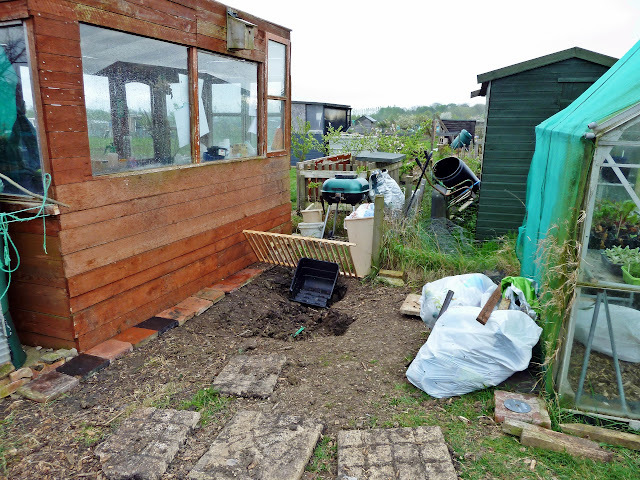 Bit concerned the local rodents might have a field day gnawing through the polytunnel walls so decided to use some paving slabs going spare to surround the base from the outside. Sampson the cockerel isn't particularly impressed with progress. Paving slab surround now completed, let the digging commence! 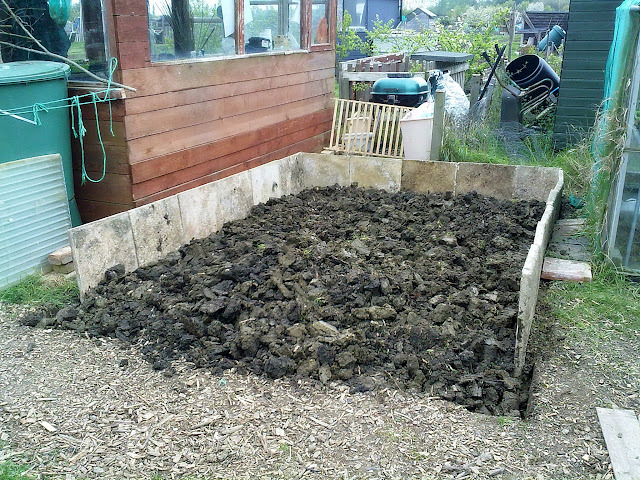 Decided it would be best to do the heavy duty digging before putting up the polytunnel. Knowing my luck I'd put a spade through the wall otherwise. Digging finished. After this stage I put in two level raised beds and hammered in levelled wooden pegs on which to rest and tie down the polytunnel frame. The frame and cover were easy to put up. 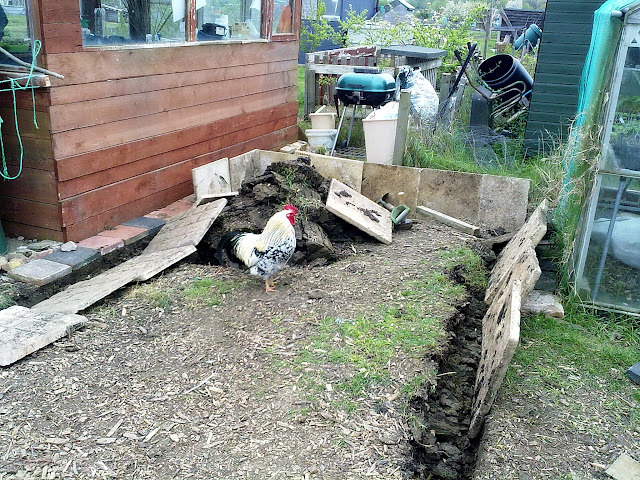 Once installed I put loads of wood chip into the cavity between the polytunnel and the paving slabs. On both sides there's just enough room for me to squeeze through if I need to. After finishing off with wood chip down the middle of the raised beds, the first plants go in... cucumber and squash. A few weeks later, having kept the zipped front closed to keep the warmth in, plants are growing well. Started to keep the front open to enable pollinating insects to do their job. 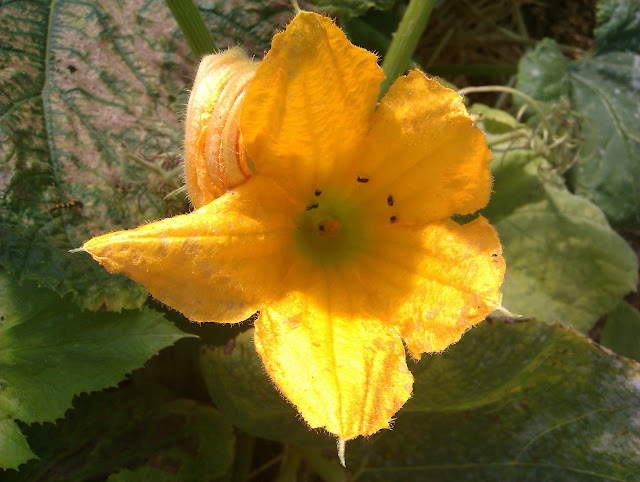 Now virtually having to beat the gourds back with a stick to get in the polytunnel. 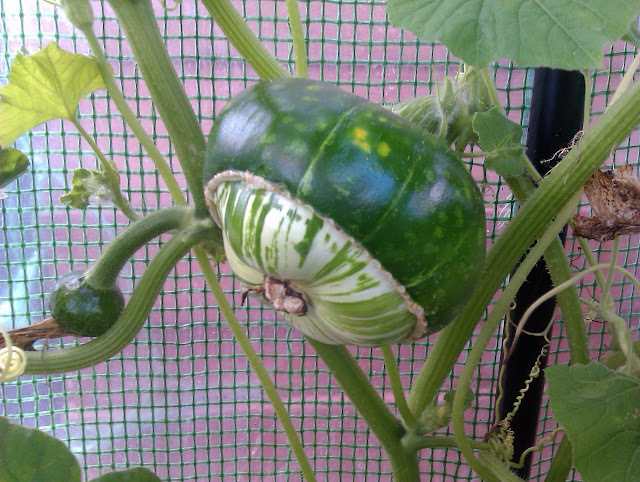 One of the types of gourds I'm growing for the first time. Another type of gourd getting bigger... and bigger... and bigger! Since you can't eat gourds, wonder what I'm going to use them for? Here's some samples of gourd art. Amazing, eh? 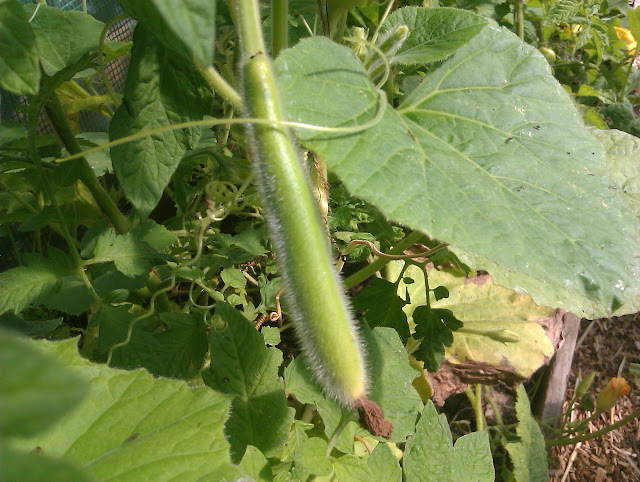 A developing snake gourd, from which you can make a didgeridoo and craft other works of art. But there are early signs of wear... partly my own fault! When putting up the polytunnel frame make sure you put bolts in so the bolt heads are showing outwards from the frame. It's not so obvious since the easy way is to screw the bolts in the highest part of the frame from the inside out. But this leaves the bolt ends sticking out into the polytunnel cover. I've temporarily compensated for this by covering the bolts with thick cardboard and will repair when I take the cover off in winter... although I am intending to grow lettuce over the winter months so not sure when that'll happen. How do bees get into the tunnel to pollinate your plants? Clearly, they're doing their work, but how do they enter? Hi Lisa and Robb... Initially the bees couldn't get in 'cause I had the zip down entrance closed. As soon as the plants got established and didn't need the intense warmth I zipped open the entrance and it keeps open with ties provided on the top of the entrance. Quick update on how the polytunnel is surviving. SIgns of wear at just about every point where there's any friction between cover and frame caused from the wind. 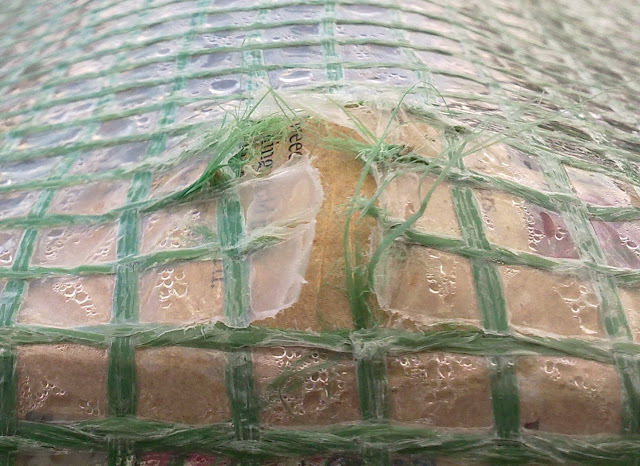 The webbing which strengthens the plastic is holding but the plastic is wearing away at friction points. I'll repair the damaged parts with strong tape before Spring, but a bit worrying when Winter is yet to come and therefore more severe winds! Another update, post Winter. I left the polytunnel up over Winter. Appears the plastic is deteriorating either becuase of sun damage or friction from the wind. Either way, the result is the plastic is coming away as tiny squares, mainly around the edges. Don't think it'll cause a problem for the coming season, but not sure how much of the plastic cover will be left this time next year! After just two winters, the Gardman polytunnel is on shreds. Hardly any plastic left and the webbing coming away at both ends. I'm repairing with scaffold netting. I'll post a link to the update as soon as the job is finished... but unless you're willing to take the plastic covering down each winter (which will mean you might get another year or two of use), are willing to spend £60 on a replacement cover every two years, or replace with an alternate cover as I am, the Gardman polytunnel isn't worth the money. My Gardman polytunnel shredded during its first winter, and a lot of it had lost the "tiny squares" you describe. A friend also has one, now hredded and useless, the zips having failed within a few weeks, as well. However my daughter's blew over, but we put it back up last week and the cover was crisp and undamaged..... All three tunnels had been up for about 10 - 12 months. I have just ordered a replacement cover for £45 including delivery....I plan to remove the cover over the winter and hope it last a bit longer. Hi... replacing with scaffold netting does create a micro climate and the netting is much tougher than the original plastic and lasts for years. I kept what was left as the original cover on the frame and blanket stitched the netting all around to the cover. hi ,i would definately not buy another cover for my tunnel. The first one i had was returned to the shop within the first 3 months due to the zips failing and holes appearing where the bolts were, replacement was given which lasted until the winter when we decided to take it down due to it again having holes appear. Put it back up following year only for the zips to go again, it has now got 3 of the zips sown up and numerous patching has been done - am hoping it will last this year and will replace with netting next year. Thanks for that info. 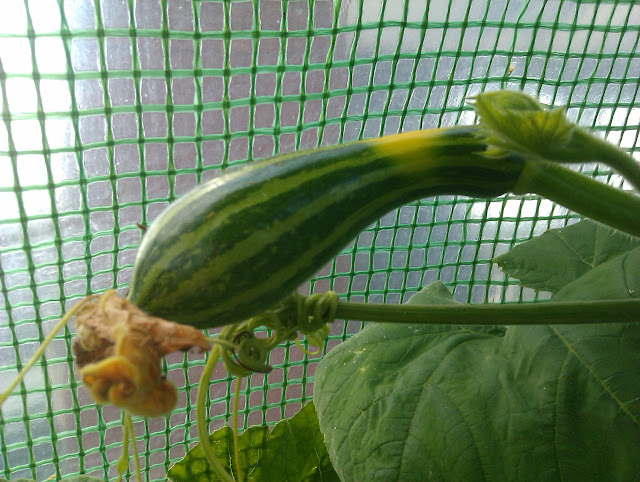 Confirms the gardman polytunnel is not worth buying. my gardman poly tunnel lasted me about 6 months the wind battered it around and the sun made it brittle un known to me i should have put some tape on the bars to help with the heat on the metal. the cover has gone on each of the hoop sections near the seams. and there were two other people who bought the same ones theirs have gone to there were no instructions to say we needed the heat proof tape in the box. if i use builders netting to try and repair it if i can will it damage my sewing machine or would you use normal plastic sheeting to cover it. i was also thinking of getting a replacement cover and using the builders netting over the top do you think it is worth it. Hi... Thanks for the comment. I used scaffold netting and hand blanket stitched it to what remained of the original polytunnel edging. Works well and is pretty tough, although it does take a few hours to do and you need a large needle. Used standard twine. I'd guess plastic sheeting would last longer than the original Gardman plastic, although not as long as the scaffold netting. The Gardman poly tunnel is not fit for purpose. In anticipation of winter wind damage I secured a large skip net (like a cargo net) over the top and pulled it down tight. This held it in place through all the winter storms and I would suggest is a much better solution than securing it around the bottom only. The plastic is still in good shape after 8 months. Without the net it would have been ripped to shreds. However the zips all failed within a few weeks and my only option now is to get a new cover. I sent a photo of the broken zips to Gardman and they are going to send me a new cover FOC. I am assured that the zips have been upgraded but time will tell. Thanks for your comment. Would be surprising if Gardman had upgraded the zips within a few weeks of your purchase, given the time has been on sale for a good few years. Please post a comment again in a while to update progress. My scaffold netting isn't just sewn to the bottom of the frame, but all around the two ends as well. It's pretty secure. Seems the plastic shreds mainly from sun damage rather than wind. Keeping my fingers crossed yours last more than two years. The new cover turned up last week as promised. The zips look exactly the same as the old ones so don't hold out much hope but we will see. I bought a tunnel and the zips failed in a couple of months complained to the firm and they sent me a new cover when that failed and I complained again they sent me another cover free of charge. We wrapped the whole frame in pipe insulation and taped over all the joints because the bolts rub through, but the cover still only lasted about twelve months the cover always tears apart where it has been stitched and the squares of polythene pop out. I am going to try covering it with polytunnel polythene. Its a shame about the cover breaking because I think it has the potential to be a great product. I grow some great toms and cucumbers in it. 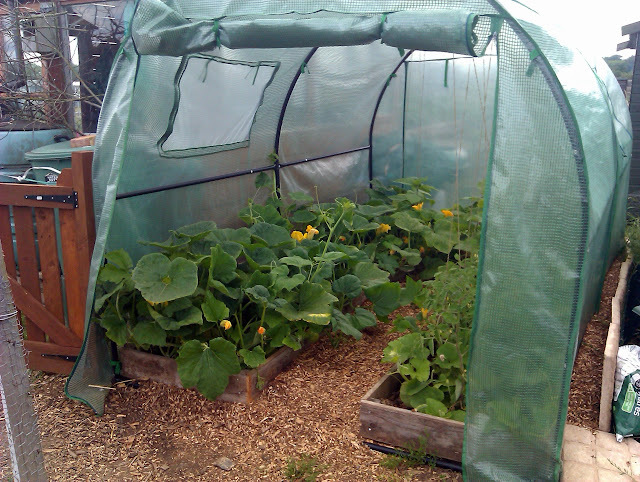 Bought Guardman polytunnel last week, erected it, that was easy, today we have a gale force wind (April 12 2015) had to hastily take down as it was in danger of blowing away and or destroying the frame. It was held down and also tied down. Very disappointed but I guess you get what you pay for. Wouldn't recommend unless in a very very sheltered position. Mine was beside my old green house now converted with ply to a part glazed potting shed. Thanks for the info. 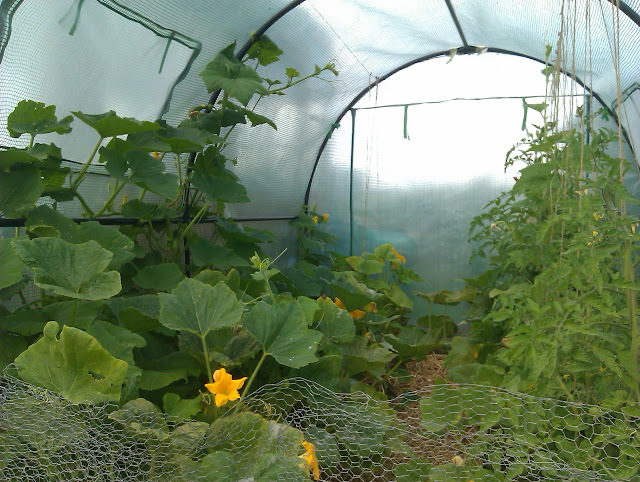 I'm not sure there is a good position or use that would ensure long term survival of this type of polytunnel! I was planning to buy one for my allotment but now have second thoughts. How well does the frame and what diameter are the tubes ? I have my eyes on something similar on e-bay with 0.9mm tube but could not find any info on Gardman. How well does scaffold netting do with rain ? Never used it. Hi... I'd avoid buying the Gardman type polytunnel. Bit of a rip off in more than one way. Unless you take the plastic covering in over winter, it's unlikely to last much more than a year. Even then, sun damage will deteriorate the covering more quickly than you'd like. The 9mm tubing you mention is thinner than that of the Gardman model. If you're able enough and your climate allows (not sure if you're in the UK), I'd recommend plastic tubing covered by scaffold netting. This will last for ages, cuts down the wind and allows rain through to water plants below. You can view a plan and see how mine developed at the tow links below. I wish I'd found your great blog earlier! We put up the same polytunnel two years ago and I bought our third cover earlier this week!! we had problems with one piece of tubing misshapen, then the zip broke - that was only in the first three months. Admittedly Gardman's customer team were great in sorting things out and we received replacements and a replacement cover very quickly with no quibble. The actual frame seems quite sturdy and has survived two winters now with no deterioration at all - but the latest cover hasn't lasted 12 months without completely deteriorating and eventually just falling apart in strong winds. 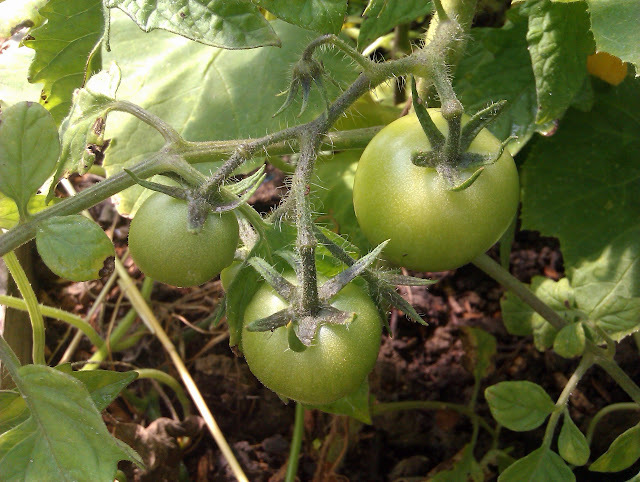 It is very good when it works, and we have grown some fantastic tomatoes in it. So my experience is the same as everyone else's here - we'll take it off after the autumn to see if we can get a couple of years out of it. However, I do think your idea of scaffold netting is a great solution because the frame itself may last quite a long time. But with the scaffold netting, is there enough of a microclimate to do really well for tomatoes - i see you grew cabbages which obviously don't thrive in quite the same mediterranean conditions that the gardman cover can help create! Hi... Thanks for adding a comment. Whilst scaffold netting won't create quite as protective an environment as the original tunnel covering, it will help your tomatoes to last longer than if planted outside. Scaffold netting does give some protection from frost and will last for years. It also has the advantage of letting rainwater through, saving you from having to water quite so regularly. Did you click the linking the post giving you the latest update? That shows you how I sewed the scaffold netting to the Gardman frame.